Bestie Currywurst's grand opening in Chinatown on June 19, 2013. Published in Vancouver Is Awesome. 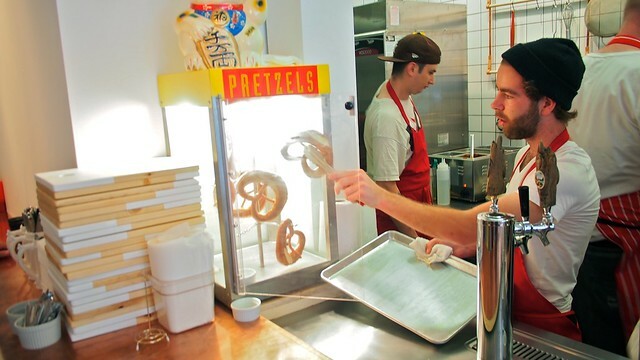 Chinatown's new sausage parlour, inspired by German street food culture, has finally opened after much anticipation. I tried currywurst for the first time a couple months ago on the mean streets of Recklinghausen in Germany and was thoroughly delighted. The dish is a 1949 Berlin invention born from having an abundance of leftover curry powder from British soldiers after WWII. It’s served as a proper German bratwurst pork sausage, steam then fried, sliced and seasoned with hot curried ketchup (on top of fresh cut fries). 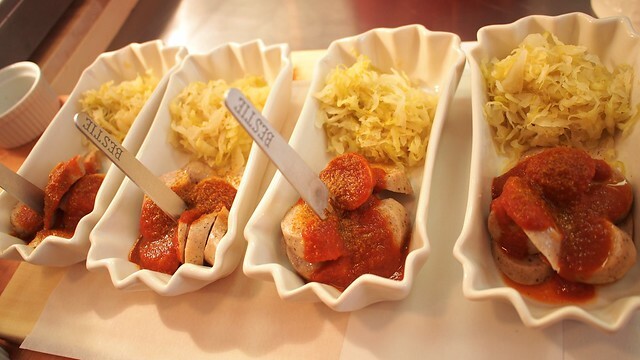 Here, we were served sausage and sauerkraut (very top), another popular offshoot of the classic dish. 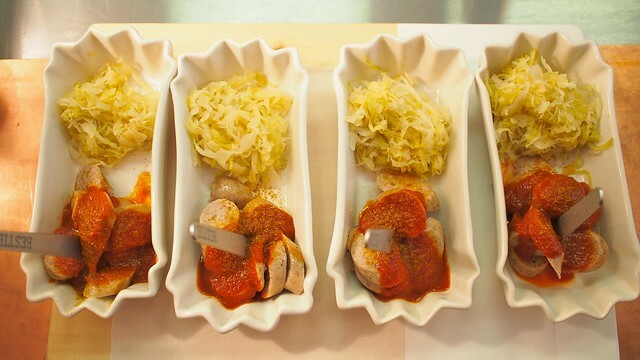 Bestie offers four choices of wurst ranging from classic pork thuringer, southern BBQ turkey, Turkish lamb, or veggie wurst. 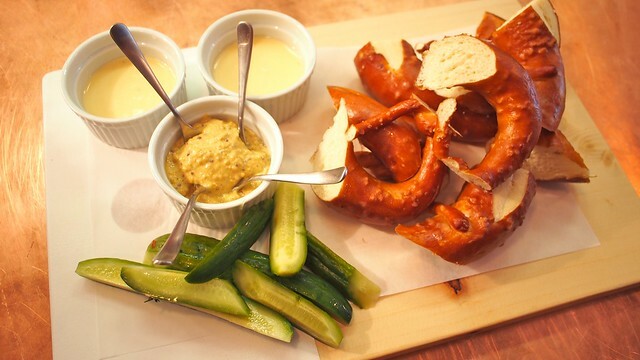 My highlight was their warm, baked pretzel board (another German staple) served with stinky cheese sauce and house mustard. It was certainly a fresh and delicious treat. Unfortunately, their deep fryer was on the fritz so we didn't get to enjoy our currywurst served classically over hand cut fries. Bestie's design, interior, and overall branding is striking with a stark white and wood design decorated in a vibrant, nostalgic colour scheme, adorned with a cuckoo clock and other knickknacks. The locally sourced sausage, selection of craft beers, and specialty sodas rounded out the eatery impressively. 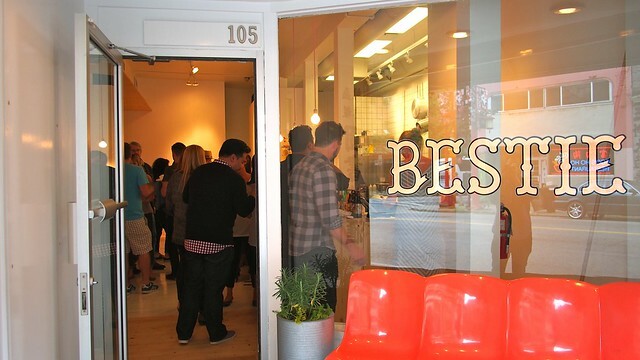 Let's hope Bestie is the start of more original and transplanted/imported food culture coming to the city. I hope the trend catches on and they work out some of the kinks. I want those fries.